In addition to Greg’s vegetables, Tannis Kowalchuk, Greg’s wife and farm partner, grows flowers at the farm for sale at farmers’ market and by special order for weddings and events. (Tannis is also the artistic director of NACL (North American Cultural Laboratory Theatre in Highland Lake, NY). 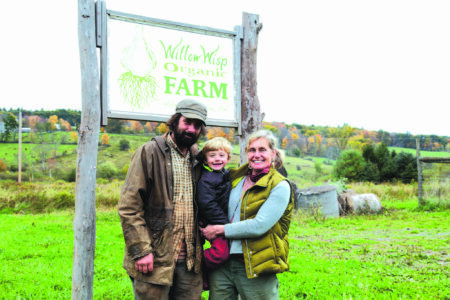 NOFA-NY LLC certifies the farm and since the new land had been a horse farm that did not grow crops or use any prohibited materials, the organic certification can start there right away. 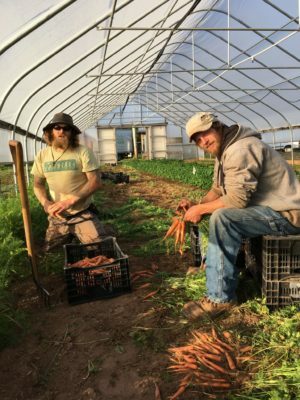 Joe Powell and Brian Bennet bunch carrots from the hoophouse beds. Greg and his crew spent 2016 preparing infrastructure, cover cropping and adding minerals and lime to the 30 acres of fine linden sandy loam. They renovated the existing barn to include a wash-pack room, workshops, loading dock and walk-in coolers, built new greenhouses, including a heated one and put up an 8 foot high peripheral fence to keep out deer. For the future, Greg plans to add solar panels on the barn roof, fruit trees, asparagus, microgreens, more flowers and vegetables and build a commercial kitchen so that they can have their own line of value-added products as well as event space. The goal is to spread production through the year and keep extra heavy harvest times to a minimum. 2017 will be the first year of 12-month production. In 2016, the farm had five full-time and four part time employees, all local. Four of them work year round on salary. To guarantee them a living wage, Greg wants to make it possible for everyone to be able to work in a professional position, to be able to raise a family and pay off a mortgage. He is not there yet and admits that he may always need to hire a few part-timers. For his core workers, however, beyond day to day work and training, he is engaging them in whole system planning as well as continuous education. The farm paid for most of the crew to attend the NOFA-NY winter conference. Greg wants to institutionalize summer tours of other exemplary farms. He hopes that each employee will engage in what is happening and be the eyes and ears of the farm. He will make the final decisions, but the crew will be invested in what they are doing together. 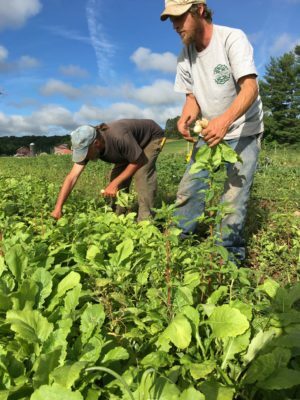 Employees Brian Bennet and Mark Keoppen pick radishes. All crew members engage with the financial side of the Willow Wisp business. They determine crop increases from year to year by current sales and expenses. Wages range from $10 to $15 an hour, based on experience. Greg starts new employees at the low level and does a review after the first 30 days. Annually, he reviews their performance, engagement, what they need to be mindful of, and checks in on how they are feeling and what else they might need to integrate better into the farm. Besides pay, the farm provides coffee breaks with coffee and snacks, lunch (one person cooks each day and the farm provides the ingredients), and they can take home all the produce they need for their families. The full time workers get personal and vacation days based on their annual review and how long they have been with the farm. Greg says that most of his workers earn more than any other job they could find in that area. Impressively, all nine 2016 employees are returning for 2017! To finance the move and expansion, Greg has attracted a few investors. These are private loans with individuals, not equity investors. There has been one round of financing for expansion and he is about to start a second. The farm pays interest on the loans, negotiated with each investor. Greg has a novel way of structuring the payments, backloading them to time with when the farm has more cash flow. He pays interest only payments for the first 6 months of the year and principle payments for the 6 months when the farm has more money coming in. Greg has also taken out bank loans with an operating line of credit. A slow money group is forming in the area. Greg is working with them, envisaging how slow money could help.